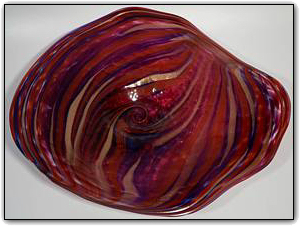 This wallbowl contains one of the boldest color combinations imaginable: ravishing red, deep pink, blues, purples, and large veins of real gold adventurine sparkles create a truly elegant work of art. And this wallbowl is gigantic, measuring a full 28" across. Wallbowls can be hung on a wall just like a picture or they can also be set out as a table bowl as well. To hang the bowl on a wall, all you need is a secure hook on the wall and a hanging apparatus comes along with the bowl. Hanging the bowl is a breeze and should take less than 10 minutes. You won't believe the compliments you are sure to receive when displaying this absolutely stunning wallbowl!